Moscow continues to designate the Taliban as a terrorist group, but at the same time has made consistent diplomatic contacts. 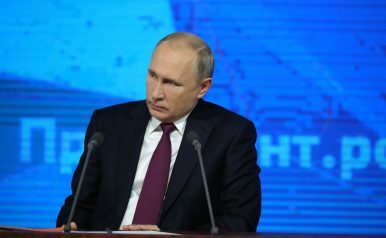 On December 20, Russian President Vladimir Putin stated that the Taliban’s interests should be taken into account in the Afghanistan peace negotiations, as the organization administers a large amount of Afghan territory. When probed further on this issue at his annual year-end press conference, Putin claimed that public negotiations between the United States and the Taliban were “probably inevitable,” and that Russia would support a peaceful resolution to the conflict that engages all major political forces in Afghanistan. In spite of this conciliatory rhetoric from Putin and Russia’s decision to host the Taliban at a multilateral forum in Moscow on November 9, 2018, Russia continues to officially label the Taliban a terrorist group. Russia’s decision to designate the Taliban as a terrorist organization was made in February 2003, after the Taliban endorsed Chechnya’s bid for independence and attempted to sell 500 heavy weapons to Chechen rebels via a Saudi charity, al-Haramain. Closer diplomatic links between Russia and the Taliban have not resulted in this designation coming under review. In September 2016, General Oleg Syromolotov, Russia’s Deputy Foreign Minister entrusted with the counterterrorism portfolio, stated that the Taliban remains a designated terrorist group in Russia because it is viewed as such by the United Nations (UN). Russian state media outlet TASS also uses the bracketed phrase “terrorist organization outlawed in Russia” in its press releases on Afghanistan in reference to the Taliban. Russia’s decision to keep the Taliban on its list of designated terrorist groups, even though it engages with the organization in diplomatic dialogue, is intriguing and can be explained by two principal factors. First, keeping the Taliban on the list of designated terrorist groups aligns closely with the Kremlin’s established definition of terrorist activity. Former Russian diplomat Viacheslav Matuzov, who led the Lebanon and Palestine desk of Communist Party of the Soviet Union (KPSU)’s International Department from 1974-1989, told The Diplomat, that Russia views any non-state actor that targets civilian populations as a terrorist group. In the Middle Eastern context, Matuzov argued that this definition allows Russia to distinguish militant organizations, like al-Qaeda and Jabhat Fatah al-Sham in Syria, from Hezbollah, which targets the Israeli military and works within Lebanon’s existing political system. As the Taliban regularly targets Afghan civilians and denounces Afghan President Ashraf Ghani’s government as illegitimate, it is unambiguously a terrorist group, according to Matuzov’s definition, which is widely accepted within the Russian foreign policy establishment. Second, designating the Taliban as a terrorist group allows Russia to obfuscate the extent of its cooperation with the organization to the international community. The Russian government has cited the Taliban’s status as a terrorist organization to justify its claims that it only engages with the organization to release Russian hostages in Afghanistan and to track ISIS’s presence in northern Afghanistan. This argument was used by the Russian Foreign Ministry during its July 2018 outreach to India, when Moscow stated that it engages with the Taliban to safeguard Russian civilians in Afghanistan. Russia’s deflection strategy has reaped dividends, as Indian officials have refrained from expressing public concern about the Russia-Taliban relationship. As Russia is unlikely to remove the Taliban from its list of designated terrorist groups for the foreseeable future, the appropriateness of making concessions to the Taliban remains a subject of heated debate within Russian policy circles. Carnegie Moscow Center Director Dmitri Trenin told me in a 2017 interview that Moscow believes in diplomatic engagement with as broad a range of actors as possible, with a special exception being reserved for transnational terrorist groups, like ISIS. From this vantage point, Russia’s diplomacy with the Taliban could underscore the flexibility of its foreign policy and resemble its successful 2012 diplomatic outreach to Egypt’s Muslim Brotherhood, which Moscow also labeled as a terrorist group. Within Russian policy circles, Putin’s special envoy to Afghanistan, Zamir Kabulov, is the leading supporter of Russia providing tactical recognition of the Taliban’s hegemony over regions of Afghanistan where it has a large presence. In a July 2018 comment to media outlet Kommersant, Kabulov argued that the Taliban’s establishment of “parallel power bodies” and a court system that is held in higher esteem than official Afghan institutions, makes the organization an indispensable player in Afghanistan. While Kabulov’s preferred approach to engagement with the Taliban appears to be pragmatic, it is fraught with considerable risks. A recent analytical piece for the Valdai Discussion Club, authored by Richard Burchill, argued against Russian multilateral engagement with the Taliban by stating that the November 9 talks could encourage other militant organizations to believe that terrorism reaps dividends. Russia was accused by numerous Afghan government officials of legitimizing terrorism after the November 9 talks, and was only supported by Libya and Zimbabwe when it sought to strike down a UN motion on Afghanistan that ignored Moscow’s diplomatic role. In addition, Russian policymakers are concerned that legitimizing the Taliban’s authority over Afghan territories that it occupies could have unintended negative consequences for Moscow’s arbitration ambitions in Syria. In the Astana and Sochi processes, Russia has refused to grant enclaves of territory to Syrian rebel forces and delegitimized the occupation of Syrian territory by groups that are not aligned with President Bashar al-Assad’s government. To avoid having its arbitration role in Syria undercut by allegations of double standards, Russia is likely to refrain from overtly recognizing the Taliban’s hegemony over regions of Afghanistan until a durable ceasefire is achieved in Syria. Even though Russia is seeking to expand its diplomatic influence in Afghanistan by courting the Taliban, Moscow’s desire to uphold a coherent set of international legal principles and deflect from its relationship with the Taliban will likely ensure that the Taliban remains a Kremlin-designated terrorist group for the foreseeable future. The question of whether or not Russia will ultimately recognize the Taliban’s control over areas of Afghanistan that it governs remains highly contentious. However, Russia’s concerns about international opprobrium could prevent Moscow from making a firm determination on this issue until further progress is made in Syria and more countries officially accept a role for the Taliban in the post-war Afghan government. Samuel Ramani is a DPhil candidate in International Relations at St. Antony’s College, University of Oxford specializing in post-1991 Russian foreign policy. He also contributes regularly to the Washington Post, The National Interest and Al-Monitor. He can be followed on Twitter @samramani2. A revealing interview with Putin's top envoy in Afghanistan suggests continued rapprochement with the Taliban. The first nuclear-powered submarine reportedly capable of carrying the Poseidon underwater drone was launched on April 23. In an era of increased electoral polarization and agitation, what are the lessons of Indonesia’s tame campaign?